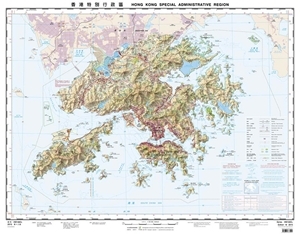 Hong Kong Special Administrative Region on a topographic map at 1:100,000 from its official Survey and Mapping Office, with bilingual place names and English language map legend. Current edition was published in 2015. The map has contours at 50m intervals, vividly enhanced by relief shading, plus colouring and graphics to show swamps, mangrove, mud areas, cultivated land and woodlands. Nature and/or marine reserve boundaries are marked. Road network differentiates between expressways/major roads, secondary roads and tracks, with footpaths also marked. Railway lines indicate main lines and light rail transit routes. 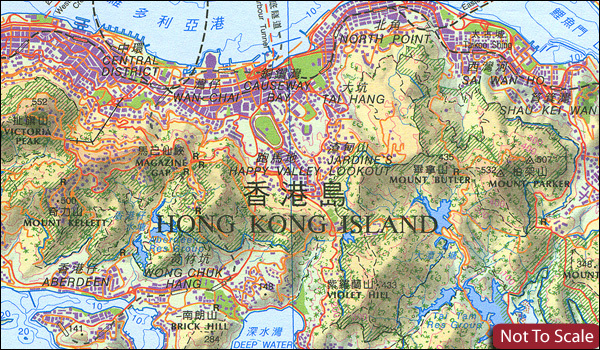 Outside the region’s borders, in Shenzhen and adjoining area information is limited to colouring indicating built-up areas, plus selected roads and railway lines. The map has a 10-km UTM grid with additional margin ticks at 1km, plus the old Hong Kong 1980 grid on which it is based. All place names are in both Chinese characters and the Latin alphabet, and where appropriate in English. Map legend is in Chinese and English.